Since 1974, Top Hat has been a trusted name in caring for your home. As our services and product offerings have expanded, that same commitment to quality, craftsmanship and expertise has driven our growth. Using only top notch suppliers and ensuring top caliber staff provides you with the Top Hat experience. Our showrooms in Ottawa & Carleton Place have close to 100 fireplaces, wood stoves, and inserts on display, with most operational, so you can see before you buy. With expertise in gas furnaces, heat pumps, boilers, radiant and forced air heating, and top brands like Lennox, Amana and Goodman — you can trust Top Hat to keep you safe and warm. Enjoy the comfort and reliability of Top Hat’s service. We carry top manufacturers like Lennox, Amana, and Goodman; and a series of ductless mini-split air conditioners and heat pumps. Beautify and warm your home. As one of Ottawa’s most trusted fireplace installers, our showrooms have 100+ fireplaces and stoves on display — you’re sure to find your ideal solution. Protect your family with comfortable and healthy indoor air. We provide duct cleaning, heat recovery ventilation, filtration, humidification and/or dehumidification. With decades of experience, we provide Ottawa’s ideal chimney cleaning and/or repair service. For safety, heat efficiency and proper maintenance, trust Top Hat Home Comfort. Maintain the safety, beauty and value of your home. Top Hat Home Comfort’s experienced masons provide expert chimney and brickwork repair. Expert and reliable workmanship, along with high-quality materials, puts a safe and dependable roof over your head. Top Hat is certified to offer a 50-year manufacturer warranty. Protect your home, and its value. Quality repairs or replacement of soffit, fascia and siding. Top Hat is also the exclusive dealer for Gutter Helmet in eastern Ontario. A clean and healthy home! Our trained cleaning technicians, a powerful truck-mounted cleaning system, and advanced chemical treatments provide deep, anti-bacterial cleaning. Looking after your home is our priority. Whether you need a new roof or gutters, have indoor air comfort concerns, want the warmth and beauty of a new fireplace, or require chimney/brickwork maintenance, we make your concerns our priority. 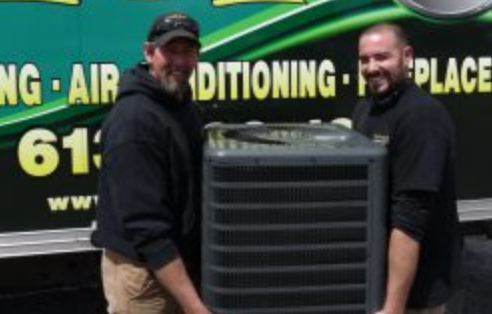 Appreciate the rapid service and the professionalism of the installers. Your staff were extremely efficient, professional and friendly.